Kari Daley is a licensed master social worker in New York City. She holds a Master of Social Work from Columbia University, as well as a Bachelor of Arts in political science from Roger Williams University. Crawdads, also known as "crayfish" and "crawfish," are small shellfish found in freshwater rivers and ponds throughout the United States. They look like miniature lobsters and grow to be 3 to 6 inches long. Because crawdads live in freshwater, it is important that they are cleaned thoroughly before they are cooked. Poorly cleaned crawdads may be filled with sand and debris. With a few simple tools you can clean and cook traditionally seasoned crawdads at home. Fill the large soaking bowl with cold water and gently stir the crawdads with the slotted spoon to release any dirt and debris. Throw away any crawdads that float. If the crawdads float they are dead and cannot be safely eaten. Continue purging the crawdads, draining the dirty water and refilling the bowl with fresh water, until the crawdads have released all of their dirt and debris. When the crawdads are completely clean and ready to be cooked, the soaking water will be clean. Depending on how dirty your crawdads are, it may take three to five soaks. Fill the large pot with water and bring the water to a boil. Add 4 to 5 tbsp. of Cajun flavored spice mix. Pour the crawdads into the boiling water and bring the water back up to a boil. When the water begins to boil again, set your timer for 5 minutes. 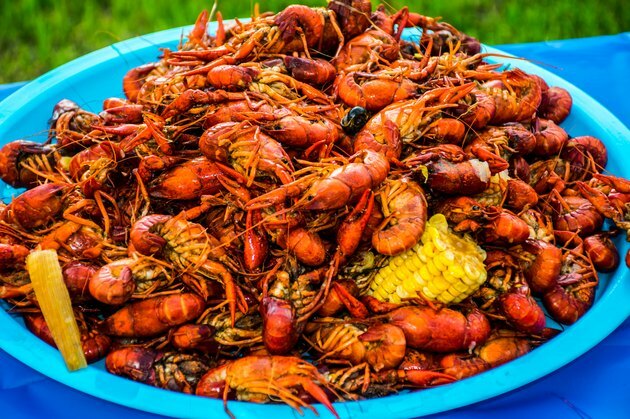 After the crawdads cook for 5 minutes, take the pot off the heat source and allow the crawdads to soak in the hot water for 20 to 30 minutes. The longer the crawdads soak the more flavor they will have. Drain the crawdads with a large strainer or scoop them onto your serving platter with the slotted spoon. Serve them immediately with lemon, hot sauce and melted butter flavored with Cajun spice mix. Twisting the crawdad in half and sucking the meat from the head and tail is a popular way of eating crawdads. Crawdads are a messy finger food. Have plenty of napkins on hand to wipe up the juices. The crawdads will be extremely hot when they are finished cooking. Pour them onto a piece of butcher paper and warn your guests to let them cool slightly before touching their shells.